Did a New Yorker Cartoonist Predict Today's Apps in 2009? There is an app for just about anything and everything these days. Even back in 2009, a cartoonist for the New Yorker knew what was up. 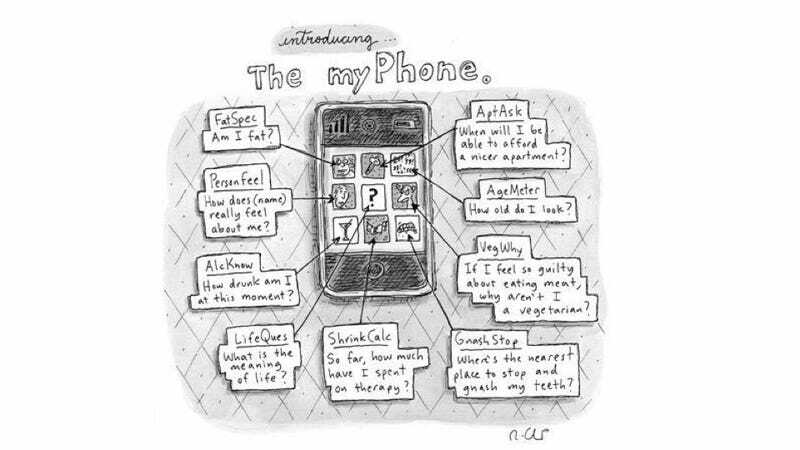 Roz Chast drew "myPhone"—the cartoon marked the iPhone's first appearance in the magazine—for an issue that ran July 27, 2009. Clearly she knew the direction in which the app game was headed; her predictions were pretty spot on. Below I've tried to find the most appropriate app from the iTunes App Store to go with each of Roz's cartoon predictions. BMI BodyFat Calculator can calculate your BMI (body mass index), your body fat, and recommend diet plans and exercises to get you to your healthiest target. "Wondering if your feelings are mutual? Conflicted Feelings allows you to invite your friends (or more than "just friends") to take the quiz about you." Caveat emptor: this app is for entertainment purposes only. "BreathalEyes is the only app that can approximate an intoxicated individual's blood alcohol content (BAC), anytime and anywhere! Revolutionary, patent pending technology puts the functionality of a breathalyzer on your iPhone. Effective range: 0.02% - 0.17% (+/- .02%) BAC." This is, allegedly, the "ONLY app on the App Store which genuinely answers the greatest question of all time." "Mint.com allows you to track, budget and manage your money all in one place, so you can see where you're spending and where you can save." If by "gnash my teeth" we mean "nosh on some food" then Yelp is where it's at. HappyCow.net is "the world's premier online vegetarian, vegan, and veg friendly restaurant guide." HappyCow's iPhone app makes abstaining from meat super easy by showing you wear to find vegetarian food all over the world. PhotoAge uses "an advanced artificial intelligence engine to approximate how old you look" in photographs.